In July, the Community Foundation of NCW welcomed six new board members to their team: Hank Manriquez, Ron Skagen, Mike Stancil, Mike Steele, Darci Waterman, and Anne White. Hank Manriquez was born in Los Angeles, CA and joined the US Coast Guard in 1965 where he spent 4 years between Alaska and San Francisco. He then became a manufacturer’s rep in the pet-supply industry covering 14 states and in 1997 retired from the business with gross sales of over $12 million annually. Through smart investing, Hank retired in the Leavenworth area where he owned a vacation home and has been a part-owner in a local lodge since 1986. He is enthusiastically involved in the community, especially with the Leavenworth Chamber of Commerce and the Bavarian village concept. Hank is the President of the Cascade Farmlands Association, promoting agri-tourism in Chelan and Douglas counties; a member of the 2% lodging tax committee for Chelan County, working with local politicians to pass Senate bill #6237 to change ag-tourism regulations for the State; started the Leavenworth Cards business; and developed Certified Folder Display company to over 160 accounts. Hank’s strong skills involve marketing and sales. He shares a Leavenworth home with his wife, Stephanie, and their menagerie of special dogs and cats. Ron Skagen is a fourth-generation Douglas County resident and graduated from Eastmont High School in 1972. He earned a degree in Business Administration from Washington State University in 1976 and later graduated from the first class of the Washington Agriculture and Forestry Education Leadership Program. He is a Commercial Loan Officer with US Bank specializing in agri-business and has been a Commissioner for the Douglas County PUD since 2007. Ron was recently appointed as a Trustee to the Wenatchee Valley YMCA and is an active participant in the Eastmont School District, chairing on the 2004 Levy Campaign and serving on the Fiscal Advisory Board Committee. He married his wife Lisa in 2000, and they enjoy a blended family with seven adult children. Mike Stancil was born and raised in Alabama and is a veteran of the US Army’s 18th Airborne Division, serving on the front lines as an artillery soldier in campaigns in Iraq (Desert Storm), Panama, Cuba, and Yugoslavia. He owns and operates VitaGreen, LLC since 2005 and believes in integrity and morals both personally and professionally. 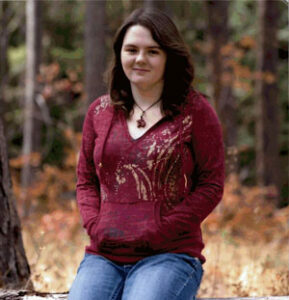 Coming from foster care in Alabama, Stancil said “I know what it’s like to live on skid row. I know what it’s like to not have a family. I feel very blessed and I want to give back.” Mike and his wife Shawn have three children and enjoy family vacations and the outdoors. Mike Steele is the executive director of the Lake Chalan Chamber of Commerce. 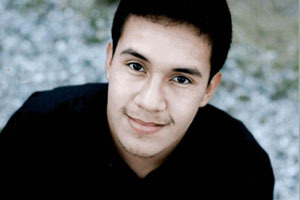 He was born and raised in Lake Chelan and is a graduate of Pacific Lutheran University with majors in Political Science and Business Administration. He has served in the White House as a member of the Political Affairs team and has worked with the Washington State Legislature as a member of the Republican Caucus staff. Mike serves as a member of the City Council in Chelan, is an active board member for the Lake Chelan Community Hospital Foundation, serves on the board of directors for the Washington State Chamber of Commerce executives, and other civic groups. Darci Waterman was raised in the Wenatchee Valley and graduated from Eastmont High School in 1985. She earned an AA from Wenatchee Valley College in 1987, and a BS in Mass Communications from Eastern Washington University in 1989. Darci is the Administrator of the Washington State Apple Blossom Festival and has been for the past 20 years. She is also a member of Wenatchee Central Lions Club and serves on the Board of Directors for the Washington Festival and Events Assoc., the Eastmont Foundation, and Miss East Cascades. Darci has three sons and enjoys attending her boys’ activities, volunteering in their schools, working on house projects, and enjoying everything about this wonderful community. Anne White was raised in the Yakima Valley and studied Business and Sociology at the University of Washington. After graduation, she was hired as one of the first two women in the Northwest to enter the Management Training Program for J.C. Penney and was among the retailers who opened the extensive Southcenter Mall in Tukwila. Anne and her husband, Robert, travelled to Korea where he served as 2nd Lieutenant in the military and she worked as a Recreation Assistant. 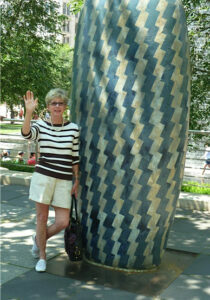 They lived in New York City and Montana, where Anne served as head of the Docent Program for the Yellowstone Art Museum, before moving to Wenatchee. Anne has worked at Davis Furniture in sales and design and Wenatchee High School as a Career Coordinator and has been active on several boards, including Apple Blossom and the Performing Arts Center, where she served as President. Anne and Robert have one daughter and love living in a community that is so willing to work together and give back. The Community Foundation also extends gratitude and appreciation to two outgoing board members Robert White and Mary C. Murphy. Robert has served on the foundation board for 26 years (since its inception in 1986) and has passed the torch on to his wife, Anne. Mary served on the board for 10 years, the last three serving as Board Chair. Their contributions to the foundation have made a significant impact in the region. Their expertise and dedication have helped propel the organization to its peak performance and is gratefully acknowledged! The Community Foundation of NCW has awarded $408,348 to 137 high school and college students from Chelan, Douglas, and Okanogan counties. It is the largest distribution of scholarship awards from the foundation to date. The awards came from 73 scholarship funds managed by the foundation that were created by donors who are passionate about local students getting the opportunity to receive secondary education. Scholarship criteria are varied and established by the donor. Some focus on specific subjects, schools, or geographic location, while others focus on leadership, academic achievement or progress, first generation, or those that simply need financial assistance in order to attend college or university. This year, 191 community volunteers served on selection committees that determined the final award recipients. Many students who receive scholarships not only appreciate the financial assistance, but better understand the spirit of philanthropy and feel compelled to give back after their education career. The Community Foundation of NCW has received a $40,000 anonymous gift to be used for helping nonprofits through the foundation’s Community Grants Program. The donor, who gave the gift through a donor advised fund at The Seattle Foundation, wanted to find a way to make a significant impact across the state. “The donor felt that the best way to affect change in the state was to give to Community Foundations, since they know the greatest needs in their communities” said Brent Ponton, philanthropic advisor at The Seattle Foundation. The donor gave to other community foundations in the state for their discretionary grant-making programs as well. The gift will be applied to the Fall 2013 and Spring 2014 cycles of the foundation’s Regional Impact Grants, which provides up to $5,000 for general programs, needs, and enhancements for 501(c)(3) nonprofit organizations. Each year, the foundation awards up to $200,000 in Regional Impact Grants and this gift increases the amount awarded by 20%, helping more nonprofits meet the needs of our region. The Community Foundation of NCW recently visited schools across North Central Washington delivering Classrooms Can! grant awards to teachers in their classrooms. Staff, board members, and selection committee volunteers surprised teachers in their classrooms with their award certificates. Classrooms Can! is part of the foundation’s Community Grants Program that provides teachers with a $1,000 grant for innovative and exciting classroom projects that engage the hard to reach learner. 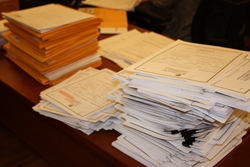 Over 130 applications were received and 47 were funded. Awards were distributed in five areas: Arts Education, Literacy, Math & Science, Technology, and Wellness. Teachers in K-12 public schools were able to apply for grants in one or more categories, with up to 10 projects to be funded in each category. Each area had a selection committee comprised volunteers in the community with expertise and experience one of the five areas and one student. Projects will be implemented in the 2013-2014 academic year. In partnership with the United Way of Chelan-Douglas Counties, Classrooms Can! grants are funded for 4 years (through 2016) through a grant from the Bill & Melinda Gates Foundation. The Community Foundation of NCW (CFNCW) has received reconfirmation of accreditation from the Community Foundations National Standards Board (CFNCSB), effective for the next 5 years. The Community Foundation’s mission is to grow, connect, and protect charitable gifts in support of strong communities. The foundation manages a permanent endowment that provides resources to improve and enhance the quality of life for the residents of Chelan, Douglas, and Okanogan counties. 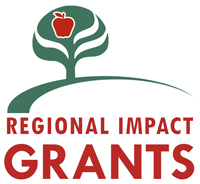 Providing various grants to 501(c)(3) nonprofit agencies is a primary way the foundation helps to make a difference in NCW communities, along with training and professional development for the nonprofit sector and offering over 70 scholarships awarded to students annually across the region who are continuing their education. Established in 1986, the foundation manages over $43 million in assets and to date has awarded over $26.6 million in grants and scholarships. 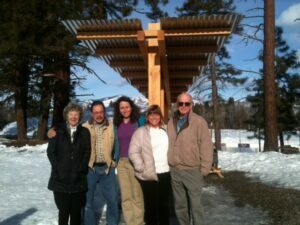 Ann Henry, Barry Stromberger, Becki Studden, Beth Stipe, and Denny O’Callahan stand under a trailhead shelter provided by the Methow Valley Sport Trails Association. The Community Foundation of NCW has awarded $41,440 in grants to 16 nonprofit organizations from the Methow Valley. In 2006, the Methow Valley Fund was established at the Community Foundation to create sustainable funding for a healthy, vibrant Methow Valley. Funded by donors throughout the valley, the Methow Valley Fund provides grants up to $5,000 to 501c3 organizations that address local community needs and enhancements. In January, the Associated Student Body (ASB) at Manson High School convened to review grant applications submitted by their own teachers and awarded $10,000 to winners for various school needs. Created by Manson residents and business owners Jack and Gale Courtney, the Manson Great Giving Grants (G3) provide an opportunity for class officers to make their school a better place while also participating in the grant-making process. The ASB students collectively reviewed 18 applications, had thoughtful discussion, determined 12 final recipients, and distributed awards to elementary, middle, and high school teachers. Managed by the Community Foundation of NCW, the grants provide funding for school needs and enhancements, and a valuable learning experience for the ASB students. CONGRATULATIONS teachers, staff, and students! The Community Foundation of NCW has received a $50,000 grant from the M.J. Murdock Charitable Trust that will fund a new financial and account management system. The software, purchased from Blackbaud, Inc. (a renowned nonprofit software company with 27,000 customers worldwide), will provide significant upgrades to streamline processes and increase donor services for the foundation. The M.J. Murdock Charitable Trust provides grant opportunities to Pacific Northwest nonprofit organizations that seek to strengthen the region. To receive a grant, agencies must first submit a Letter of Inquiry and if accepted, are then given an invitation to apply. Between 2007-2011, Washington State received $16.6 million in grants – 10% of the total grant distribution by the trust. The Community Foundation of NCW and Chelan-Douglas United Way have partnered to develop an Ending Poverty through Education initiative that is focusing on improving K-12 reading levels and increasing student engagement in schools across North Central Washington. These programs have been funded because of their innovation in providing educational opportunities and increased student engagement in low income schools. According to a report by the Annie E. Casey Foundation, “children who aren’t reading at grade level by the end of third grade are four times as likely to drop out of high school.” CFNCW and the United Way of Chelan-Douglas Counties believe our communities can reduce local poverty through stronger education for our children and greater opportunities for their continued educational success.